Andre Ward (25-0, 13 KO's) retained his WBA Super World super middleweight title and captured the WBC super middleweight title, outpointing England's Carl Froch (28-2, 20 KO's) via twelve-round unanimous decision at Boardwalk Hall in Atlantic City, New Jersey to win Showtime's "Super Six" Tournament. Official scores were 115-113 twice and 118-110. Both fighters tried to establish range with their steady left jabs in the early going. Ward, 27, landed the cleanest punch of round one, a counter-left hook off a clinch in the opening minute. Froch, 34, appeared very stiff as Ward used the center of the ring to control the round. After successive body punches from Froch, Ward opened up with plenty of accurate left hooks from his arsenal, continually striking Froch in the face. It was vividly clear by round four that Ward was much looser and fluid with his shots. Froch repeatedly struck Ward with some hard body punches, although Ward's quicker left jab enabled him to get his combinations off first. By round five, Ward really started to comfortably find the target, and was dictating the pace in round six with his superior hand speed and efficient use of angles. During round six, Ward sent Froch into the ropes with a sweeping left hook, momentarily stunning "The Cobra". After Froch connected with a well-timed, straight right-hand shot, Ward promptly responded by throwing a barrage of punches in the middle of round seven. Froch stepped up the pace in the ninth round, scoring with a multitude of lunging rights. At this point in the fight, it seemed to be Froch's most active and best round. Froch's finest chances occurred in rounds ten through twelve when he unloaded an abundance of punches, essentially going for the knockout. But, it came too late in the fight, as Ward was unmoved and calmly stuck to his game plan, meticulously placing his punches and outboxing the granite-chinned warrior from the United Kingdom. 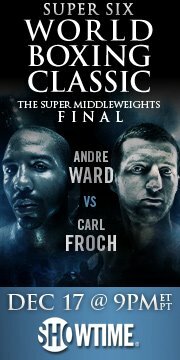 Ward had built up a strong lead, and Froch understood he was down on the scorecards heading into the championship rounds. While aggressively attacking Ward's body with both fists and landing occasional right hands to Ward's head, Froch's defense was poor in close quarters, enabling the younger Ward to connect with short, swift shots. And from the outside, Froch was simply too slow to compete with the proficient hand and foot speed of the 2004 Olympic gold medalist. Ward was never reckless, and although Froch at times connected with several solid punches, he could never really penetrate Ward's stellar defense. When Froch did land, Ward patiently stood his ground and countered with lightning-quick punches, keeping the fight in his grasp on the outside. Remember you heard it here first. Heavyweight John Guthrie is training and planning on seriously competing again. The heavyweight division needs some excitement!! Great article. Comment is interesting. Ward and Froch are both great boxers. Hope to see lots more of them in the next few years. In response to the comment above. Yes the Heavyweight division does need some excitement. But it has plenty of current boxers capable of generating it. They just need to start fighting each other. Guthrie would be ok to watch. If he still has his power. But I doubt he's going to be one to create any real excitement.